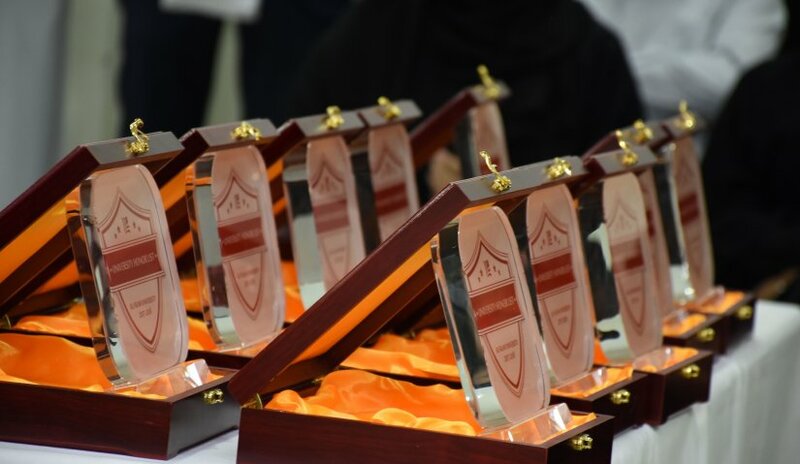 Home News > AFU Honors Outstanding Students under the Slogan "Together For Excellence"
The Deanship of Student Affairs at Al Falah University organized a ceremony honoring outstanding students from various disciplines who obtained the University's Honors for the first semester of the Academic Year 2017-2018. President of the University, Prof. Abdelhafid Belarbi, Vice President for Academic Affairs, Dr. Sameer Barghouthi, College Deans, faculty members, and administrative staff were in attendance. In his congratulatory remarks, Prof. Belarbi expressed his delight with the outstanding students’ achievements. He said that the most important factors for achieving excellence are time, concentration, perseverance and an environment conducive to creativity. Towards the end of the ceremony, the students expressed their appreciation to the University administration.